Let’s say that again…it is a mistake to compare atheism to a specific religion. As you can see the RPGist is missing the boat. Obviously, an RPGist would just be someone that plays RPG’s, the specific game is irrelevant at this categorical level, and an aRPGists doesn’t play any. Asking the RPGist what combat system he uses for RPGing is silly. She (or he) might ask you, “which game?” Some might presume you mean the one game they play and answer with that. Similarly, asking a theist where he (or she) gets his morals, the theist won’t answer, “My theism.” That would be ridiculous. All theism says is, “I believe at least one God exists.” That’s it. It says nothing about right or wrong, good or bad, how to act or not act, etc. To get those answers the theist must delve into a very specific brand of theism. In the Aztecs version of theism human sacrifice was not a bad thing. In Norse theism, War was celebrated as an honorable undertaking. In ISIS’s version of theism, throwing homosexuals off roofs and beheading non-Muslims is seen as morally ok. In Catholic theism, systematically covering up child abuse is apparently okay. As you can see, theism itself doesn’t answer questions on morality. Saying you’re a theist simply says you believe in a god. On the flip side, all atheism says is, “I don’t believe any Gods exist.” That’s it. It says nothing about right or wrong, good or bad, how to act or not act, etc. To get those answers an atheist must use some other “ism” that tries to answer those questions without a god. Many modern atheists, especially in the Western world, use Secular Humanism as their moral guide. Some use Buddhism, some use Taoism, some use Hinduism, some even use Christianity (I could probably devote an entire post on that topic). Point is, both atheism & theism say exactly zero about morality. So to compare atheism to Christianity or Islam or any specific theistic religion is unfair to atheism. It loads the playing field against it. To be fair, you need to compare Christianity or Islam to something like Secular Humanism. Sadly, I’ve yet to find a theist willing to do so. They want to try & keep the field loaded in their favor. They like to use this to appear morally superior. When they do this, they are committing a Faulty Comparison logical fallacy and I urge atheists to not fall for this trick. When you find theists committing this fallacy, call them on it. Explain why it’s a faulty comparison or link them to this post, just don’t let them get away with it. 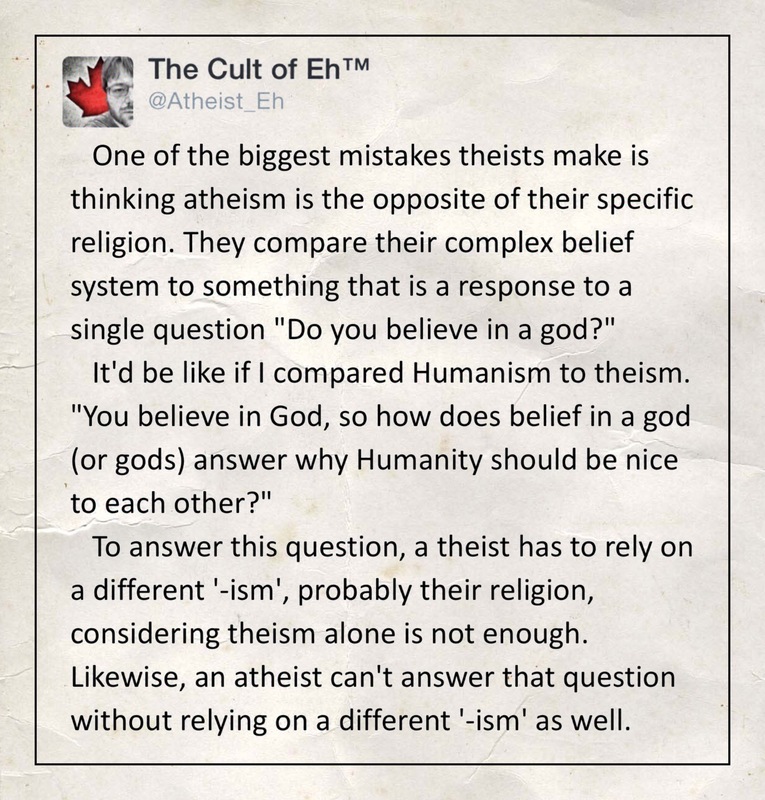 We need more theists to start understanding that atheism isn’t the opposite of their specific religion. A common tactic with this fallacy is to blame atheism for the atrocities of Stalin, Pol Pot, Mao and laughably, on occasion, Hitler. Theists that do this are never willing to blame all of theism for the atrocities of specific theistic groups. Tell a Christian they are to blame for ISIS and they will get pissy, but it’s effectively the same thing as blaming a Secular Humanist for Communist atrocities. Blaming Islam for covering up child abuse in the Catholic Church because both are theistic is obviously and ridiculously wrong. Yet so many theists don’t think twice about demonizing all atheists by being ignorant of, or completely ignoring, what atheism is.